Internal communications is widely recognized as the most complex and difficult area of corporate communications, particularly during times of challenging changes in the organization. On the face of it, it is hard to see why this should be so. After all, unlike other audiences, employers tend to have a pretty good idea of who their staff are, where they live, and even how much they earn. The problem is that the reverse is also true - employees know more about the company and its foibles than other stakeholders and have a healthy disdain for anything that smacks of ‘management propaganda'. The benefits, however, of good employee engagement programme are tangible and financially quantifiable. There is a strong and direct correlation between high employee engagement scores and profitability in organizations. And there are measurable secondary gains too in terms of retention, lower absenteeism and higher participation. 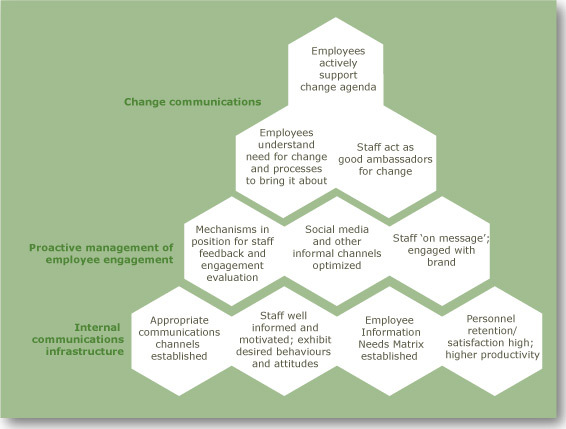 Converely, an organization that fails to dynamically engage with staff is very likely to fail in its aims. Employee views also directly affect external reputations. It has always been said that the employees are the best ‘ambassadors’ for their organization, and this is increasingly so in the age of social media. Perhaps unsurprisingly, modern research shows a dramatic rise in the perceived credibility and authenticity of employee-communicated information - and a sharp decline in the credibility of 'corporate' messaging. In fact, good employee engagement is emerging as one of the most cost effective management tools available to organizations in all sectors, not only for securing internal change but in reinforcing their external reputations. An effective employee communications strategy ensures that internal communications tools are in place and that they are integrated with brand and the organization’s overall mission. This creates the foundations on which change and crisis communications are built. Stuart Notholt, the principal Director of SNC, has over twenty five years’ experience delivering internal communications solutions to complex global organizations.